With the new effective rates data being collected it is possible to see just what the impact of these fees is on the total cost that borrowers have to pay. The ‘effective rate on overdrafts including fees’ is calculated by adding the overdraft interest flow to the flow of daily or monthly overdraft fees , dividing by the average daily balance over the month. This rate is then annualised. When fees are included, the effective rate as experienced by overdraft borrowers is 26% as at March 2017. This is more than double the rate on interest rate charging overdrafts alone. 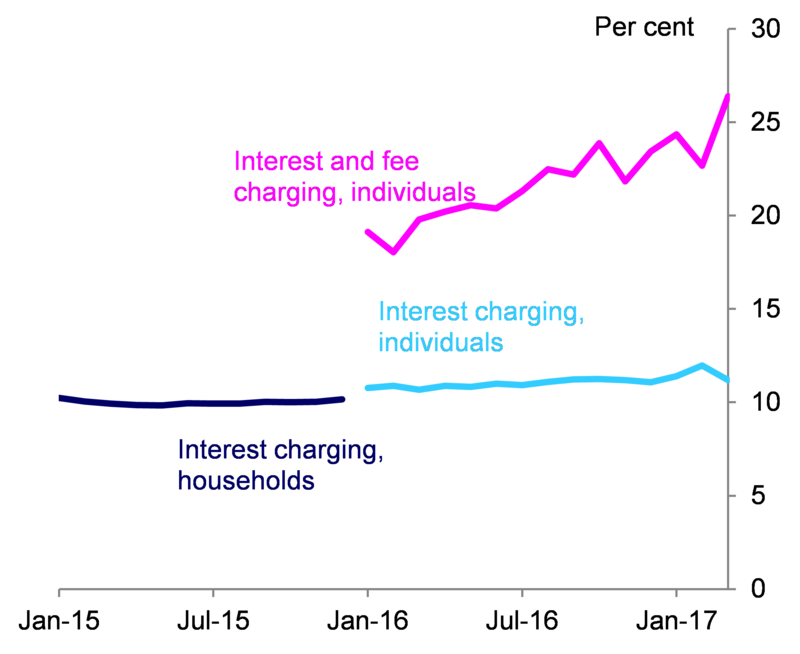 And the share of this cost is rising, in March 2017, fees represent 69% of ‘interest+fee’ flows on overdrafts, up from 59% in January 2016. Dom Tighe works in the Bank’s Data and Statistics Division. Previous Post Bitesize: How do fixed mortgage rates compare across loan-to-value ratios? Of course an element of the fee is or can be an interest rate substitute especially when associated with a fixed term loan or is a regular fee. The same ins true of mortgage discount offers……which I hope the bank takes account of but somehow doubt it as it is often behind the curve .